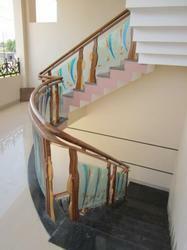 Perfect equipments : sky engineering handling complicated job in individual home on this staircase railing and balcony glass railing with tuffen glass 10mm thick, wood baluster glass railings and also finishing mirror polish. We exactly completed successfully and handling project 15days. We also followed the safety measures. It is a Wall Mouting, Hand railing on 110 running feet. They asked for mirror finishing which we exactly completed successfully. It happened within the commitment 2 days. we also followed the Safety Measures. Sky engineering doing great jop in isha mia homes in padupakkam. 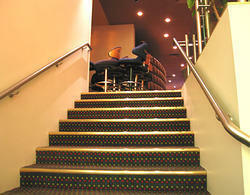 On this project running feet 1000 feet staircase railing and finishing mat polish. We exactly completed successfully on processing date 2 month we done the job we also followed safety measure. 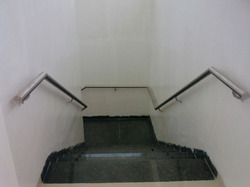 Appasamy associates in this project completed in 10 days at ambattur branch it is staircase railing holidrer model type on 200 feet they asking for mirror polish and completed successfully we also followed the safety measures. Appasamy associates in this project completed in 2days at arumbakkam branch it is wall mounding on 80 feet they asking for mirror polish and completed successfully we also followed the safety measures.